The first of the season, and I was beginning to think none would be forthcoming. 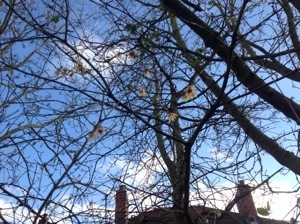 But I should have remembered that February is often the month that surprises us. I must confess that the small bit of child left in me, still loves the snow, and I always revel in the first, fresh snowfalls. And I love how it transforms the garden! The wellies are dragged out for the “walk round the estate” as I wander around shrouded in the new found quietness that accompanies a good fall of snow. 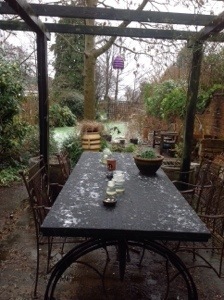 However, all the recent wet weather may well mean that this snowfall may be short lived. Part of me hopes not, as I hope to capture some of the seasonal transformations, to share with you. I will be watching closely, with brand new wellies close to hand! This entry was posted in Uncategorized and tagged snow, wellies, winter on February 11, 2014 by thelonggardenpath. I eased myself in gently(?!) by sweeping up the leaves, and bagging up for leaf mould. I must confess to not finishing this task last autumn. (I blame Christmas for starting too early!) That out of the way, I turned to a more pleasant task, my favourite task of planting. Thankfully, I didn’t have mud to contend with, so decided now was a good time. Now my two new acquisitions, my Sarcococcas, are at home. I can’t deem them to be in their final resting places, as I do have a tendency to be too ready with the spade to move plants, with a view to “perfection”. It was a lovely couple of hours work, with the sun shining and the birds already twittering away. A blackbird, as well as our old favourite robin, both decided to be my friends and come for a nosy! Even the arrival of the long forgotten, routine minor injuries that plague us – the splinters and scratches – couldn’t dampen my spirits! Mind you, the soil does still feel cold so I must restrain much of my enthusiasm for now. I felt very satisfied, and pleased with myself, and was ready for the next challenge. An unplanned task reared it’s ugly head – cutting back my golden hop. Not a favourite job, but probably best done now, before I trample over too much new growth in the border. This time I donned the gardening gloves, kept for times such as this. After all, I’m not totally daft – it’s like ripping out razor wire! And as for disposing of the dead wood – that’s like wrestling with snakes! 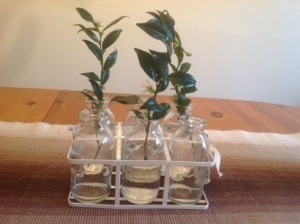 But, as a plus, I was working alongside one of my Sarcococca plantings, so the aromatherapy worked its magic! I’m considering the “Chelsea Chop” later, for my hop. The golden foliage is a beautiful backdrop to the border, but it soon overwhelms the trellis. Maybe the “chop” will help to keep it within bounds and hopefully send up fresh, new, golden growth. I’ll keep you posted! That done, it was time for a walk round the estate – has to be done at the end of a working day! The cold was beginning to get to me by then, and was soon accompanied by spots of rain, so it was time to head indoors for a hot drink. 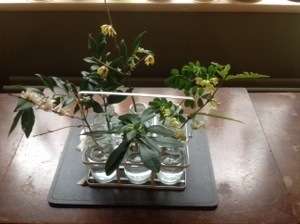 I made sure I didn’t come in empty handed, cutting a Chimonanthus twig to bring indoors. But boy, was I satisfied! The first foray is so energising! 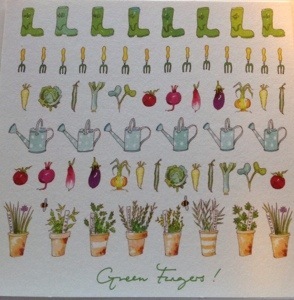 Fingers xd for many more! This entry was posted in Uncategorized and tagged First foray, golden hop, leaf mould, sarcococca on February 4, 2014 by thelonggardenpath.